If you're thinking about getting a rabbit for Easter, animal advocates in the region are urging you to think again about how a rabbit will fit into your home. "Most people have no idea about rabbit care and what's involved," said Nadia Novik, veterinary technician at the Animal Shelter of the Wood River Valley in Hailey. "They adopt this cute little bunny, and it grows, and it becomes more work than they were expecting." Novik said the shelter typically gets one or two rabbits each year that were bought for Easter and then abandoned. Hannah Parpart, spokeswoman for the Idaho Humane Society in Boise, said that while her shelter doesn't tend to get the animals right after Easter, they do see an increase over the summer. "We have rabbits that come in as strays," she said. "People find them in their neighborhood. [Giving up the rabbits is] probably due to a change in lifestyle, family moving or the kids got older and weren't interested." Abandoned bunnies aren't a problem just in Idaho. In 2010, more than 300 abandoned pet rabbits took over the campus at Long Beach City College in California, destroying thousands of dollars of landscaping and multiplying nearly exponentially every few weeks. The rabbits were being killed by predators like hawks and owls—both of which are abundant in this valley—and actually suffered from a syphilis outbreak as well. Novik said rabbits may seem like a good idea, but they need much more care than might be expected. "They are definitely more social animals, and they need to hop around and get exercise," she said. Novik said the ideal situation for a rabbit is to stay in a crate only at night for sleeping, and hop around in the home during the day. 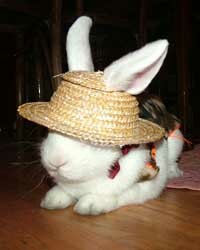 Rabbits are easy to housebreak, Novik said, and take quite well to using a litterbox. "Housebreaking a rabbit is actually not a bad idea," she said. Rabbits also need food, water and the occasional carrot. Homes should be rabbit-proofed, to prevent the animals from chewing on electrical cords. As for the abandoned bunnies, Novik said they tend to find homes quickly. "We're fortunate in that we have a great 4-H group, and sometimes they will help us out," she said, adding that adoption time is typically anywhere from a few days to three weeks.